Soto Academy is a non-denominational day school for boys and girls from Kindergarten to Grade 6. It is located on the grounds of Soto Mission Church in Nuuanu. The school was founded in 1990 when Bingham Tract School closed and its staff re-located to Soto Mission to start Soto Academy. Both staff and students who followed the school to Soto Academy immediately felt comfortable and at home, because classrooms were simulated to the old Bingham Tract School classrooms. The fine reputation established in the past for quality education continues at Soto Academy. Soto Academy is dedicated to developing good citizens and academic proficiency through character and physical development. We help students develop to their full potential socially, mentally and physically. Students are taught self-discipline, a sense of organization, and independence. We encourage creative thinking, pride and quality in accomplishment, and respect for self and others with "the 3 R's." School is an extension of home. A high level of communication is maintained between home and school. Five-year-olds are started on a program developing visual perception, listening skills, vocabulary and speech, phonics, reading, and writing. Creative thinking, a sense of organization, independence, responsibility, as well as motor skills are developed through a variety of creative and academic activities. In Math, kindergartners learn the value of numbers and how to add, subtract, and problem solve. A little homework is given to help start good study habits and to develop a sense of responsibility. Children in first, second, and third grades reinforce and sharpen the learning skills begun in kindergarten. Although the emphasis is still on reading, writing, arithmetic, a broader knowledge of science, health, social studies, and the cultural arts is further developed. The importance of good study habits, self- discipline, responsibility, and organization are stressed during these lower elementary years in order to be successful students and useful citizens in the community. During third grade, children are refining their reading skills and writing mechanics. Good study habits are stressed as short term projects and research papers are incorporated, so that a more sophisticated, thorough program may be continued in the upper grades. In math, students will have the basic fundamentals of adding, subtracting, multiplying, dividing, measuring fractions, and problem solving as applied in their various forms in every day life. Classes are usually self-contained. Students in grades five and six may change classes in some subjects when the idea seems compatible to both pupils and teachers. Such an exchange allows the student to have the advantage of the very best a teacher may have to offer. Students are responsible for several research projects and reports to prepare them for Junior High. Children in all grades attend weekly computer classes. 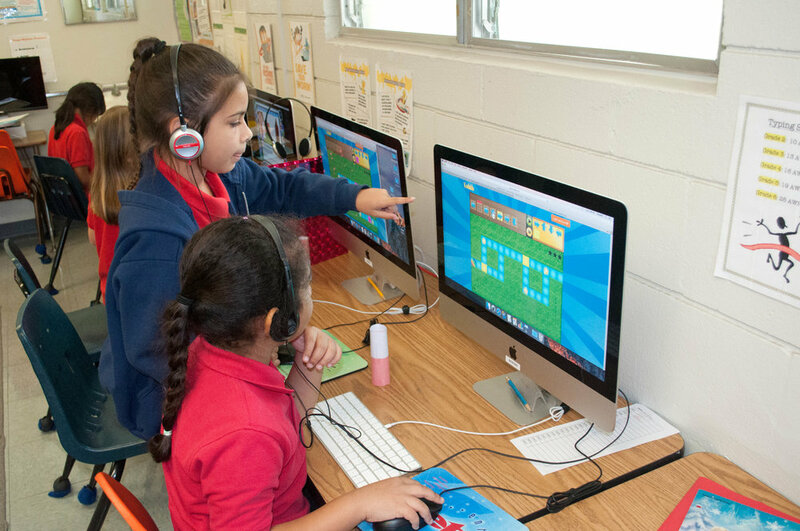 Students develop skills including keyboarding, Internet proficiency and safety, and become familiar with using a variety of productivity applications. We focus on an understanding of computer operations, file management and organizational skills, and user interface navigation. Students are made aware of the impact of technology on the individual and society. Hawaiian Studies is included in the program for Kindergarten through grade four. Kindergarteners are introduced to the Hawaiian culture by learning a variety of subject matter such as the alphabet, numbers, and colors. In grades 1-3, students continue to learn Hawaiian values through music, crafts, and storytelling. In grade 4, students are taken on a journey into learning various important aspects about Hawaii Nei from ancient to monarchial times. Lessons are laced with hula, chants, stories, vocabulary, valuable information about our beautiful islands and occasional crafts. The school year is culminated with a trip to the Big Island of Hawaii. In Kindergarten and lower elementary, students are introduced to the Japanese culture and language through weekly instruction, which includes a variety of subject matter such as the alphabet and numbers. As the program progresses, students will begin to develop their Japanese reading and writing skills. Art, music, drama, and physical education are incorporated academically, shared, or exchanged whenever possible for mutual enjoyment as well as personal development at all grade levels.